Getting pummeled by three men with kicks, punches and jabs is not how I typically spend my vacation. Yet there I was on Military Base 8 defending myself from a trio of Israeli attackers. But my assailants  brothers Avi and Shlomi Moyal and Haim Sasson  weren't trying to rob me, they were simply doing their job: training me to protect myself via the increasingly hip Israeli self-defense technique known as Krav Maga. Literally "close contact" in Hebrew, Krav Maga has its roots in 1930s Europe, where its founder, Slovakia-born Imi Lichtenfeld, developed the martial art to protect himself from anti-Semitic street gangs. A decade later, Lichtenfeld had immigrated to Israel, where he introduced his distinctive fighting system to the nation's then fledgling military, which made it part of its combat training. Today, Krav Maga is a veritable international phenomenon, with the Los Angelesbased Krav Maga Worldwide offering instruction to over 230 civilian affiliates in 17 countries and 500 law-enforcement agencies throughout the U.S. Embraced by the FBI and SWAT teams alike, Krav Maga is also a staple of high-end gyms across the globe, where a faster-paced and less-combative version provides a workout that could literally save your life. "Krav Maga has this allure to it," says David Barton, whose eponymous U.S. gyms have offered classes for almost a decade. "People gravitate toward it because of the Israeli army connection," he adds, "but also because it has practical uses beyond just getting fitter or stronger." Those practical uses were directly in my face as the brothers Moyal, whose elder, Avi, heads the Israel-based International Krav Maga Federation, taught me the fighting style's basics as two dozen Israeli soldiers practiced nearby. Against the backdrop of the azure Mediterranean a 20-minute drive north of Tel Aviv, I learned how to use Krav Maga techniques to escape from a carjacking, flee from attacks in water, and defend against knife and gun threats. The training required me to keep my hands, knees and elbows as close to my body as possible as I transformed them into weapons of short-term destruction. Take a simple 360-degree elbow rotation. In Krav Maga it can deliver a face blow, knock away a weapon and place an opponent in a headlock  all in a single movement. My course was a condensed version of the Moyals' biannual Tour and Train experience  a 10-day program pairing intensive Krav Maga training with tours of major Holy Land sites like Jerusalem and the Dead Sea. Launched almost a decade ago, the program was initially envisioned as an opportunity for Krav Maga enthusiasts to learn directly from the masters in the practice's promised land. Today, the program has evolved to include live-rifle training along with visits to army bases to see Krav Maga in, perhaps, its rawest form. "People want to train at the source, with instructors who learned from the source," says Avi Moyal, 44, who studied Krav Maga with Lichtenfeld before the master passed away in 1998. "They also want to meet like-minded folks from around the world, to become part of this Krav Maga global community." When it first launched, Moyal's travel program mostly attracted committed Krav Maga fans keen on improving their skill set and visiting a new nation. While regular practitioners still form the bulk of his business, Moyal says his customer base is expanding  in unexpected ways. There are a fair number of first-timers, who hear about Krav Maga while on vacation in Israel and want to experience it before heading home. More notable, he says, is the increase in business travelers who seek Krav Maga training to defend themselves when working in high-risk destinations. 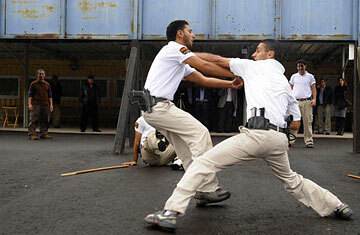 "These guys already have bodyguards and security, but they want to feel confident that they can do something for themselves," says Moyal, who spends half his time outside Israel training new Krav Maga instructors, private security firms and law-enforcement officers. "Or, at the very least, gain a greater understanding of how security works." The signs of Krav Maga's growing trendiness  the scenic locations, the fancy gyms and the growing number of Krav Maga competitions  have created a schism between Krav Maga purists who adhere to its core combat values and the mavericks who view Krav Maga as equal parts sport and self-defense. Rhon Mizrachi of the New York Citybased Krav Maga Federation says there are now American and Israeli styles of Krav Maga, the former focused on fitness and fun, and the latter strict and straightforward. But, he says, unlike flash-in-the-pan fitness fads, this practice has history on its side. "Krav Maga was around long before the Jane Fonda workout, long before spinning," he says. "This is really the most primitive exercise known to man: fighting to stay alive." See 10 Things to Do in Tel Aviv.